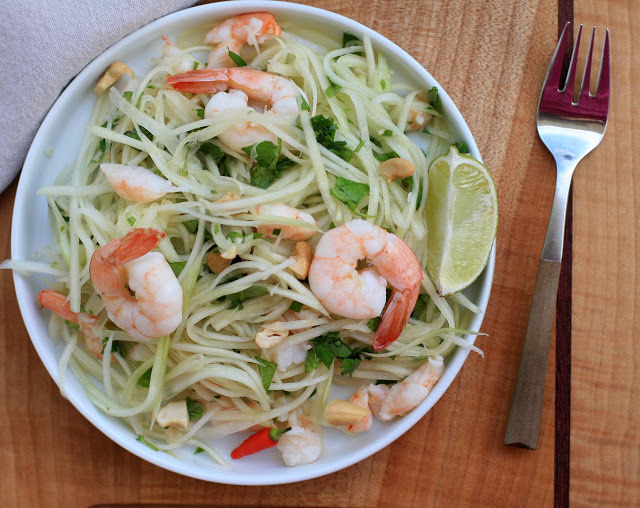 Those of you who have been reading for awhile might remember that I made a green papaya salad with shrimp back when I was cooking Tahitian food. I liked it just fine, but I had a sneaking suspicion that the Southeast Asian version, which incorporates my beloved fish sauce in the dressing, would be even better. I try not to play favorites, but I liked this version even better. 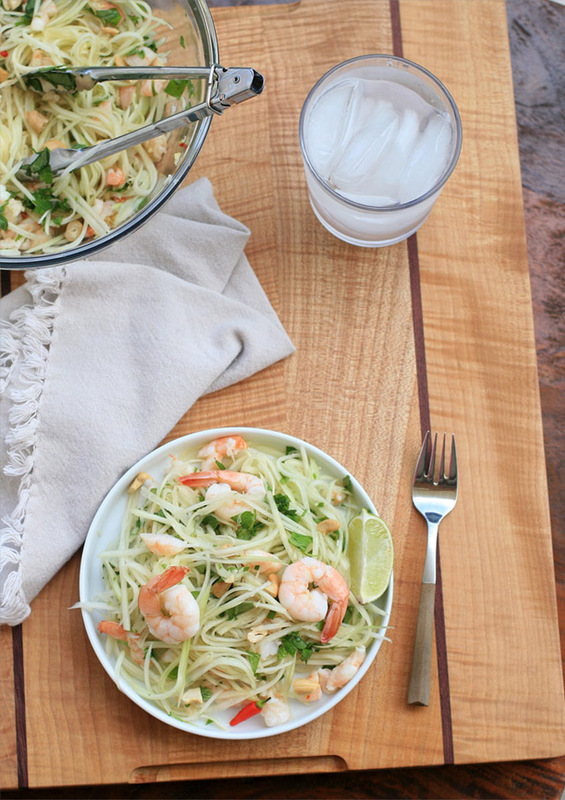 If you haven’t experimented with fish sauce before, it’s about time you give it a shot. At first the smell can be, shall I say, overwhelming? I recently made some Ga Kho for my family and while they loved it, my mother (who is blessed/cursed with an excellent sense of smell) couldn’t get over the fish sauce aroma that permeated the kitchen. After cooking with it for years I actually don’t even notice the smell anymore. 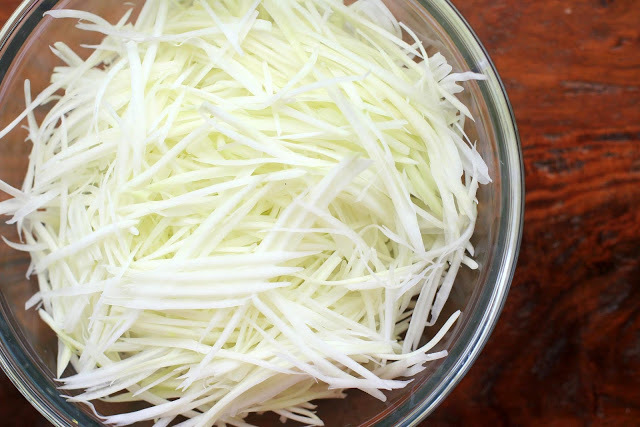 I’m lucky enough to be able to buy pre-shredded green papaya at my weekly farmer’s market, making this salad a snap to put together. And as with many Vietnamese salads, this one doesn’t contain any oil- just a mix of lime, garlic, chile, fish sauce and chile pepper. Also feel free to play around with the protein add-ins to make this a more substantial one-dish meal; I’ve seen variations of this salad with slices of grilled pork of beef mixed in with the shrimp. 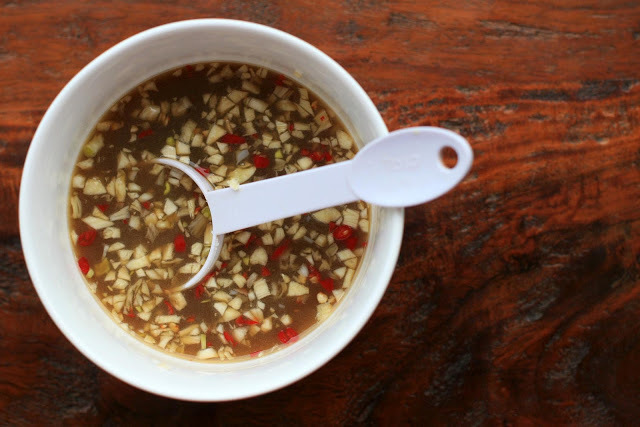 In a small bowl combine the fish sauce, lime juice, garlic, sugar and chile. Stir well and set aside. 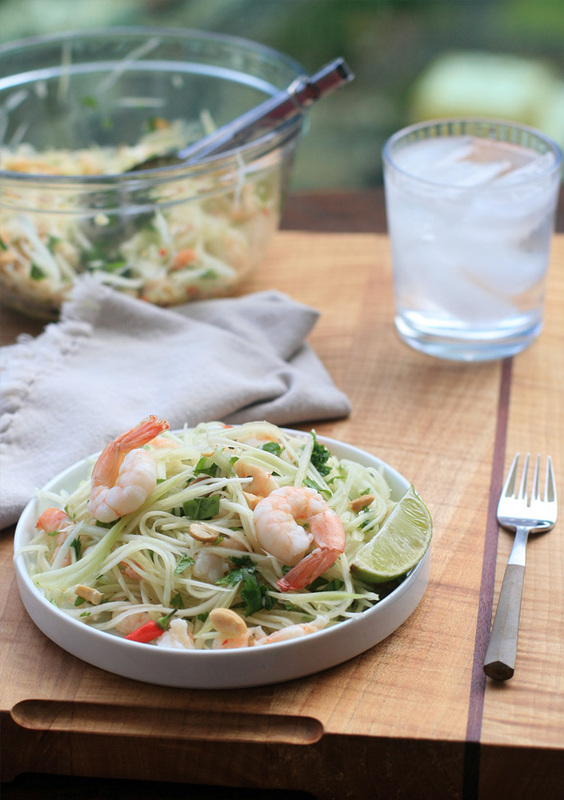 In a large bowl combine the green papaya, shrimp, cilantro, mint, rau ram, and Thai basil and toss. Pour on the dressing and toss again to coat. Sprinkle with the peanuts and serve immediately or let the flavors meld for 10-15 minutes, and then serve. Note: if you aren’t able to find rau ram, you can just increase the amount of cilantro, mint or Thai basil so that you end up with one full cup of chopped herbs.